More than anything else, adult smartphone users in the U.S. wish their devices had longer battery lives. Avenir Telecom appears to have had that desire in mind while developing the Power Max P18K Pop smartphone for Energizer. The French telecom company unveiled the new phone at the 2019 Mobile World Congress (MWC) this week, and it’s an absolute beast of a device, containing what Avenir claims in a press release is “the highest capacity battery ever seen in a smartphone” — but don’t expect it to fit in the pocket of your skinny jeans. According to Avenir, the Energizer smartphone features an 18,000 mAh battery, enough to last for 50 days in stand-by mode. The iPhone X contains a 2,716 mAh battery, for comparison — giving the P18K Pop more than six times the capacity. If you want to actually use the P18K Pop, you could spend 90 hours making calls, listen to 100 hours of music, and watch 48 hours of videos on just one charge, according to Avenir. Beyond this long-lasting battery, the phone also includes 6 GB of RAM, 128 GB of storage, and five cameras, two of which are front-facing. The trade-off for all of the P18K Pop’s battery life comes in its size — the phone is a whopping 18 millimeters thick. That’s well over double the thickness of the iPhone X, which is 7.7 millimeters. 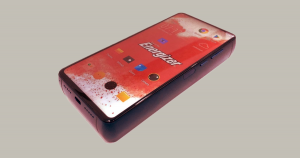 Still, if you’re willing to forgo some form for function, the new Energizer smartphone could be worth keeping an eye on, and according to Avenir, it’ll be taking orders for the device at MWC with plans to begin deliveries this summer. However, before you get your heart set on owning a P18K Pop, keep in mind that Avenir promised to release an Energizer smartphone with a 16,000 mAh battery in September — and that device was seemingly cancelled before it could hit the market.